Our guide to slicing through even the trickiest challenges. We've finally got our hands on a brand-new Cut The Rope game, and we gave Time Travel a very well-deserved 4.5 out of 5 stars in our review today. We've got complete video walkthroughs to all of the game's levels on their way, but if you prefer a few spoiler-free general tips, we've got you covered there too. - You've got two mouths to feed now, so be aware that the actions you perform on one Candy may well have a critical effect on the other. Once you're in that mindset though, it can often make it easier to understand the solution. To complete a level, each character must get a single Candy - don't forget to grab the stars too for a higher rating! 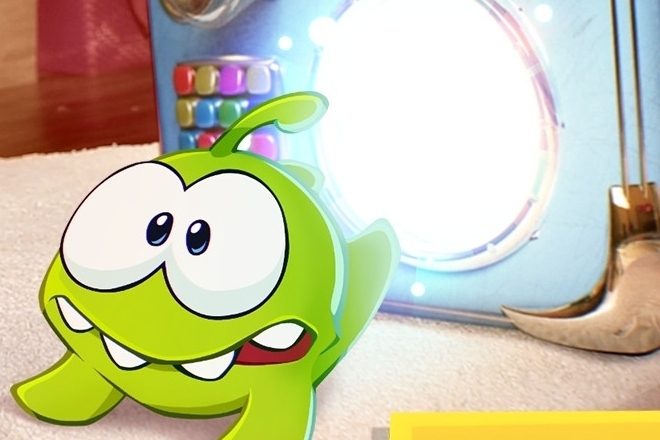 - There are plenty of new objects to deal with in Om Nom's latest adventure, and the one that can cause the most unpredictable effects is the bomb. If it comes into contact with anything, it will detonate and push any swinging objects outwards. Because of its impact on the level, if there's a bomb on the screen then that's a good sign you need to start with that object and work outwards. - Be aware that those powerful saws don't just cut through metal chains, they will cut through everything they come into contact with - including the Candy itself. Lose your Candies, and it's game over, so be ready to save them from danger at any moment. - The Telekinesis system may be a bit of a cheap way to get through the tricky levels, but it is a useful tool if you become really stuck. To use it, select the lightning icon at the top left-hand corner of the screen and press your finger behind any object to invisibly push it forward. Alternatively, we're going to be bringing you walkthroughs for the whole game, so keep a close eye on the site to save yourself some cash. - Timing's more important than ever in this new edition of Cut The Rope. Bouncy platforms and moving spike rails can undo all of your hard work very quickly. Once you know the moves you need to execute, try doing so as quickly as possible from the start of the level. No luck? Start again but wait a second before starting things off - repeat until you get your timing just right. At the very least this should get you through the levels, even if it means you don't get all of the stars. - The Freeze button doesn't just temporarily pause the on-screen action when you press it, it will cause all moving objects to lose their previous momentum. This becomes incredibly important in later levels, so be aware of the properties of this extremely valuable tool. 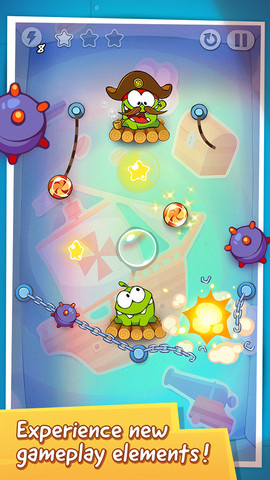 If you've paused a moving, bubbled Candy just above Om Nom or his partner, pop it then deselect Freeze to have it drop into the waiting mouth below! - Don't be too intimidated at the sight of a complex puzzle. Most of the challenges of the game are made from distinct, component sections - try to get a feel for the way these components come together, and above all else, experiment. You're only a quick reset away from getting a little closer to the answer. - You might have noticed some new elasticated ropes in Time Travel. They're usually attached to moveable switches - the further you stretch the rope, the more force it will inflict on objects when it's sliced and comes into contact with them. Keep this in mind when you need to use force to push a certain object a certain distance - and at a certain angle too. Sometimes just a little bit of force is better than too much.